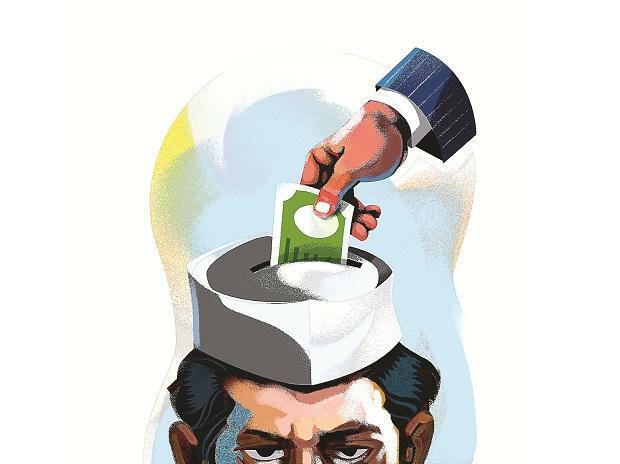 Akhilesh Yadav-led Samajwadi Party (SP) had the highest expenditure at Rs 34.54 crore out of the 37 regional political parties that have submitted their audited Income Tax Returns (ITR) reports to the Election Commission of India (ECI) for financial year 2017-18 (FY18), revealed a report. 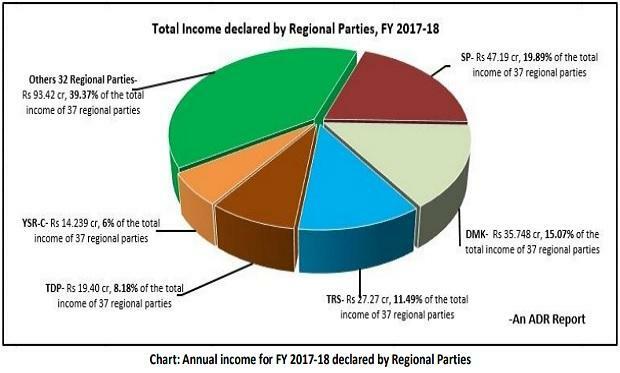 In FY18, the total income of all the 37 regional parties looked at by the report was Rs 237.27 crore. 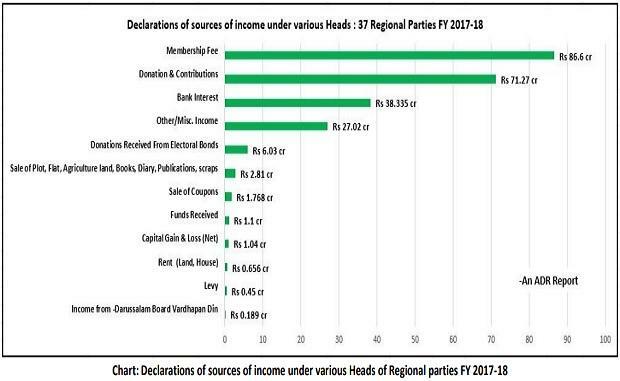 Further, the SP, DMK and TRS' total income, which added up to Rs 110.21 crore, accounted for 46.45 per cent of the combined income of all the regional parties covered. The report analysed the income and expenditure of 37 regional political parties that have submitted their audit reports to the ECI for FY18. The parties had time till October 30, 2018, for the submission of their annual audited accounts. The report highlights that out of the 48 regional parties considered by it, only 20 submitted their audit reports on time, while the submissions of 17 parties were delayed -- ranging from a single day to 110 days. In fact, the FY18 audit reports of 11 regional parties, including Bodoland People's Front (BPF), Jammu & Kashmir National Conference (JKNC), and Jammu and Kashmir Peoples Democratic Party (JKPDP) were not available on ECI's website till the date of the preparation of the report. 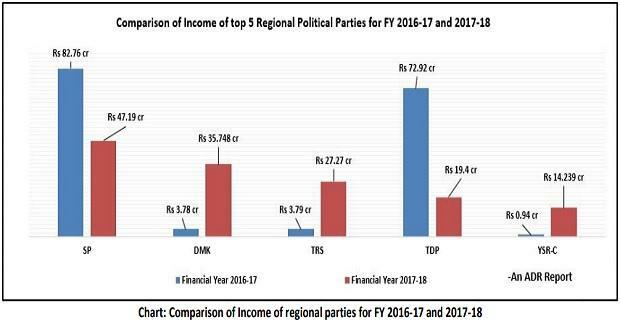 1) The SP and TDP, which were among the Top 5 regional political parties, reported high incomes for both years -- FY17 and FY18. 2) The DMK, TRS and YSR Congress Party (YSR-C) saw the maximum increase in income at Rs 31.97 crore, Rs 23.48 crore and Rs 13.30 crore, respectively, from FY17 to FY18. 3) Out of the 37 regional parties looked at in FY18, 40.54 per cent, or 15 parties, showed a decline in their income from FY17 to FY18. 4) It found that nineteen parties, or 51.35 per cent, showed an increase in their income from FY17 to FY18. 5) Three regional parties, or 8.11 per cent, did not submit their ITR to the ECI in FY17. The parties that did not submit their audit reports for FY17 are: All Jharkhand Students Union (AJSU), All India Forward Bloc (AIFB) and Jammu and Kashmir National Panthers Party (JKNPP). 6) The total income of 34 regional parties (after accounting for AJSU, AIFB and JKNPP) decreased from Rs 409.64 crore in FY17 to Rs 236.86 crore in FY18. This amounted to a decline of Rs 172.78 crore, or 42 per cent. 7) The expenses of these 34 parties for FY17 stood at Rs 468.63 crore and decreased by 63.72 per cent, or Rs 298.61 crore, to Rs 170.02 crore in FY18. 1) It found that 37 regional parties collected 32.58 per cent, or Rs 77.30 crore, of their total income from voluntary contributions (including donation, contributions and electoral bonds) for FY 2017-18. 2) Out of the 37 regional parties, only the HD Deve Gowda-led Janata Dal (Secular) (JD(S)) declared receiving an income of Rs 6.03 crore during FY18 from contributions through electoral bonds. 3) The regional parties generated 36.50 per cent, or Rs 86.6 crore, of their income through membership fee during FY18. 1) Grants, donations, contributions, fees, subscriptions and interest income were some of the most common sources of income that featured among the top three across regional parties. 2) The top two sources of income contributed more than 94 per cent of 29 regional parties' total income received throughout the year. 3) At Rs 22.91 crore, the TRS received the highest amount from 'fees and subscriptions'. It formed 84.01 per cent of the party's total income. 1) Election expenses, along with administrative and general expenses, were the most common type of expenditure on which parties spent the highest amount. 2) The top two items of expenditure accounted for more than 80 per cent of the total expenditure of 24 regional parties, or 65 per cent of the total regional parties. 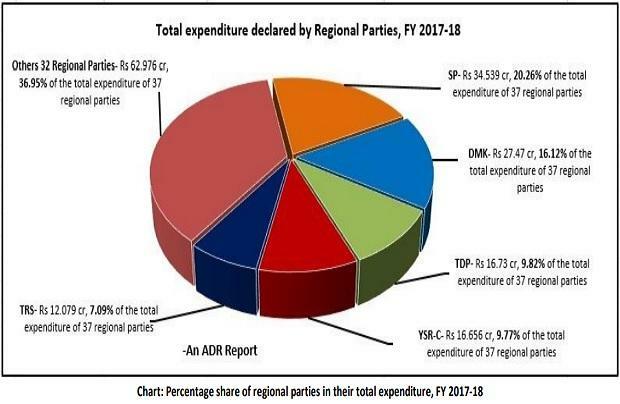 3) Among the top 5 parties that reported spending the highest overall amount, SP spent the maximum (Rs 25.05 crore) on election expenditure, followed by DMK spending the highest (Rs 22.30 crore) on administrative and general expenses, and the YSR-C spending Rs 16.01 crore on election expenditure. The report revealed that 15 out of the 37 parties incurred expenditures that were more than their total income. Of these, five parties -- AIFB, Indian Union Muslim League (IUML), Indian National Lok Dal (INLD), Shiromani Akali Dal (SAD) and Naga People's Front (NPF) -- overshot their FY18 incomes by more than 25 per cent. The five parties that reported an excess of income over expenditure during FY18 were SP, DMK, TRS, Biju Janata Dal (BJD) and Janata Dal (United) (JDU). Further, TRS reported the highest 'excess of income over expenditure' at Rs 15.19 crore, followed by the SP with Rs 12.65 crore and JDU with Rs 10.32 crore.